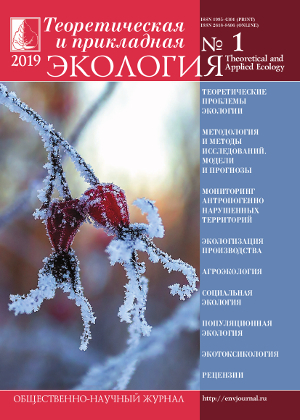 Social and Scientific Journal "Theoretical and Applied Ecology" publishes articles in Russian or English in all areas of environment and related sciences: original papers, review articles, and chronicle information, reviews of interest to the scientific community. Articles may be accepted for publication only if they are not previously published or submitted to other publishers. Content of articles must be related to the environmentally secure development of the economy and consumption of natural resources, new theoretical and methodological approaches to the assessment of man-made contamination of natural environments and objects, structural and functional organization and sustainability of ecosystems under changing environmental conditions, control of the man-caused emissions, and distribution of pollutants in natural environments, sanitation and rehabilitation of chemically contaminated areas, principles and technologies of waste management, greening of industrial and agricultural production, dedicated to the formation of ecological culture of the population. Summary (preliminary) messages are not accepted. Article received by the journal pass through unilateral anonymous peer review involving at least two reviewers. The editors reserve the right to reject without review articles that do not meet the profile of the journal or decorated with a breach of the rules. Editors ask the authors in preparing manuscripts to be guided by the following rules. The recommended volume of manuscripts (including the summary, bibliography list tables, figure captions) is up to 16 typewritten pages (for review up to 24 typewritten pages), typed in Microsoft® Word™ text editor, with Times New Roman font (14 pt), spacing 1.5, on one side of the paper sheet of standard format A4. All fields of the manuscript must be at least 20 mm. The size of the indention is 5 signs. In the preparation of the manuscript it is recommended to keep uniformity in designations, systems of units, nomenclature. It's necessary, as far as possible, to avoid abbreviations, except commonly used. If the reductions are still used, they must be transcribed in the text at their first occurrence. Decimal numbers must be separated by a comma in Russian (0,10), and a point in the English translation (0.10). The first mention of any biological species must be accompanied by a full scientific (Latin) name, in italics; the next time the name of the genus is given in abbreviation. All physical quantities should be given in the International System (SI). The point is not placed after the Universal Decimal Classification code (UDC), article title, authors, addresses, headings and sub-headings, table names, dimensions (s – second, g – gram, min – minute, deg – degrees, m – million, b –billion). The title should be brief (no more than 8-10 meaningful words), informative and exactly as possible reflect the content of the article. The article should have a UDC (determined by the author from the tables Universal Decimal Classification). 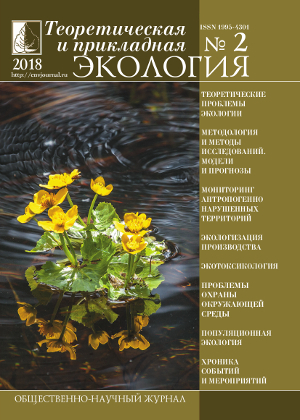 Because of preparation of the magazine "Theoretical and Applied Ecology" to placing information about it at scientific Scopus information platform, followed by indexing its content, special attention in the design of the article should be given to writing annotation (author's summary) – 250 to 300 words in English language. Compact (stowed in the amount of 250 to 300 words). It must be borne in mind that the English annotations in Russian publication are for foreign scientists and specialists main and usually the only source of information on content of articles and presented research results. Therefore, the annotation must clearly and specifically list the main results, conclusions, if necessary – the methods and objects. Not recommended use of phrases like "the article consider questions ... and discuss the problem ...". The English translation before the text of annotation is placed the English title of the article: authors' names in English transliteration, institution name and mailing address, including city and country in the English. The Russian and English keywords are attached to the paper (up to 6 words and phrases). References are given by numbers in square brackets in the order mentioned in the text. References are attached at the end. The names of all authors and full title of the cited work are presented. 1. 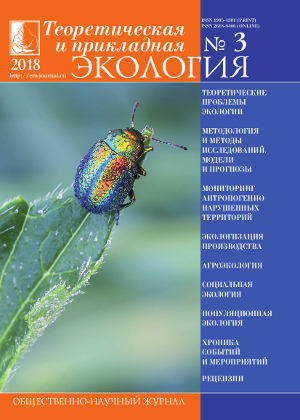 Kabirov R.R., Sagitova A.R., Sukhanova N.V. Development and use of multi-component test systems for the evaluation of soil toxicity in the urban areas // Ecology. 1997. № 6. С. 408–411 (in Russian). 2. Gautret P., De Wit R., Camoin G., Golibic S. Are environmental conditions recorded by the organic matrices associated with precitated calcium carbonate in cyanobacterial microbialites? // Geobiology. 2006. V. 4. № 2. P. 93–107. Levin S.V., Guzev V.S., Aseyeva I.V., Babieva I.P., Marfenina O.E., Umarov M.M. Heavy metals as a factor of human impact on soil microbiota // Microorganisms and soil protection. Мoscow: MSU Publishing, 1989. P. 5–46 (in Russian). Stupnikova I.V. The thermostable proteins of cereals during the low-temperature adaptation: Autoabstract diss. cand. biol. science. Irkutsk: Siberian Institute of Plant Physiology and Biochemistry, Siberian Division of RAS. 2001. 20 p. (in Russian). Gubler E.V., Genkin A.A. The use of nonparametric statistics in biomedical research. Leningrad: Medicine, 1973. 141 p.
"Gazprom" studies the track to the gas pipeline "Altai" on Ukok plateau [WWW resource]: http://www.regnum.ru/news/1443174.html#ixzz2x7kz6aiY. All bibliographic information should be presented in English or transliterated with Latin alphabet. Title typed in the original not by Latin letters should be given in English translation, and the names of authors and titles of publications if transliteration. At the end of the bibliographic record the original language should be indicated if it is different from English. The tables should not be bulky. Each table should have a serial number and the name. Columns subtitles are written with a capital letter and they should be as brief, informative and not contain abbreviations. Do not repeat and recite the numbers in the text and the data given in the tables. Illustrative materials are performed in the program CorelDRAW®, Adobe Photoshop, Adobe Illustrator. The electronic version of each table and picture must be recorded in a separate file in the format in which they were created. Captions for illustrations should be given in a separate list. Every figure must be provided with captions for all figures on a separate page. Inscriptions, cluttering up the picture, should be replaced by figures or letters that are sure to be explained in the figure captions. Axis of the graph should be accompanied by slogans reflecting their essence. On the back of each drawing its own number and the name of the authors must be written with a pencil. The photographs (minimum size 9 × 12 cm) are presented with a clear contrast image and well-developed parts. On the back of illustration must be specified the name of the author, title of the article and the number of pictures. Electrographic photocopies are not accepted. Submitted article must be signed by all authors with the first name, last name and patronymic (if any). A licensing agreement signed by all co-authors applied for the paper. This agreement gives rights to use the work in the science journal. The text of agreement will be sent to authors by email. The editorial board receives an electronic version (on any machine-readable carrier or by e-mail) and printed articles in one copy. The article is not considered if there is failure to comply with these requirements. The manuscript is sent for review to a member of the editorial board of the magazine and / or leading experts in the field of research. If the reviews contains the comments, the manuscript is sent to the author for revision. To the revised manuscript should be attached a letter from the authors containing answers to all the comments and explaining all the changes made in the article. Corrected paper is sent for re-review. He final decision on the possibility of its publication id accepted by the editorial board of the journal. A copy of the journal with the article published by are not sent to authors and distributed only by subscription. The fee is not paid. Materials sent to the editors are not returned. The full text of the manuscript and illustrations in electronic form. The printed text of the manuscript (1 copy), signed by the authors. The agreement on transfer of copyrights (license contract) signed by the authors. Information about the author(s): surname, name and patronymic, position, name of the organization which carried out a work, academic degree and title, postal address, phone numbers (work and home), fax, e-mail address of the author (co-authors) printed on a separate sheet. The names of institutions should not use abbreviations. You must also specify the person which editorial board will correspond with. 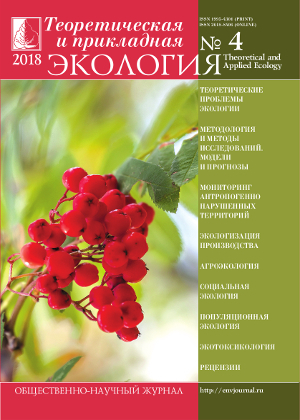 All printed materials are provided to the journal for mail address: Russian Federation, 610002, Kirov, Krasnoarmeyskaya st., 26, the editors of the journal "Theoretical and Applied Ecology", the Secretary of the journal Svetlana Skugoreva. The electronic version of the materials should be sent by e-mail: envjournal@vyatsu.ru.